This issue is devoted to the problem of correlation of religious traditions and historical memory. The role of religion becomes more and more noticeable in the contemporary post-secular world. For constructing identities are actively used religious meanings. The appeal to religious traditions is required in the analysis of discourses of historical and national memory. Belonging to any religious tradition when determining local identity can be a marker for identification of “Another”. Memory of belonging to religious tradition is often defining for self-definition of the person in the former Soviet Union. 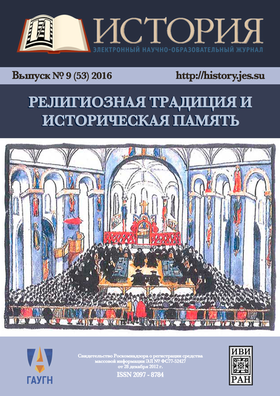 The main theme of the issue is devoted to the religious traditions in European and Russian history. The authors explore the religious context of international relation; the degree of state intervention in the life of believers of the different countries; religious practices and construction of religious identity in any communities; activity of educational structures of religious institutions. The presented case-studies are devoted to actual scientific problems and placed within the social and cultural contexts. Models of Cooperation of the Ukrainian Church Organizations with the German Occupation (1941—1944): Fact or Myth?